Recently, we went on a winter picnic. The pines, hemlocks, rhododendrons, and even the birches were beautiful in their snowy garb. My children, along with some of their friends, decided they would like to go on a hike and picnic in the snowy woods. I went along for the fun, to add some seasoned reasoning to the outing, and to enjoy the outdoors while it was freshly blanketed in snow. We had a bundle of fun. You can see by their faces they had a lot of fun. We hiked a while, then built a campfire to roast hot dogs and marshmallows. The picnic was a good time. The mild temperatures and falling snow added to the good times, and of course, the memories made by the excursion. ...two of us ended up stranded along a snow covered dirt road 100 miles from town when our vehicle quit. Forty-four degrees below zero is nasty cold and you can't just sit in your vehicle until help comes....not that far in the bush. We built a snow shelter. We cut firewood. We made a campfire. We melted snow and made Labrador Tea. We sat around the campfire drinking that tea. But we didn't have to use the snow shelter because someone actually came along and helped us with our vehicle. 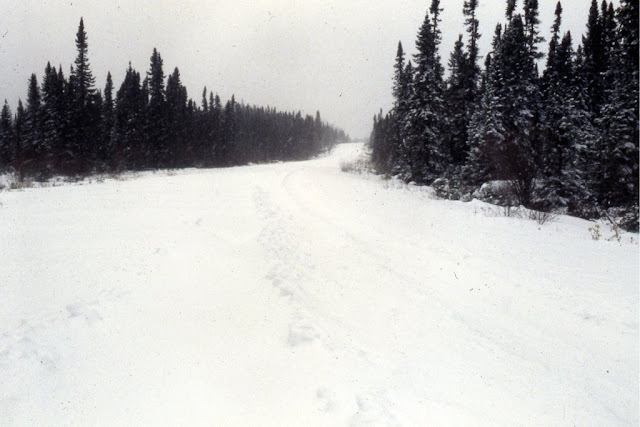 I don't have a picture of the snow shelter we built, but here is a picture of the "road"....with nothing but frozen lakes and trees for miles and miles. I've gone winter camping a few other times.... those were long nights spent mostly beside the fire. Once however, when it was well below zero some of us went winter camping. The snow was deep, and we piled up snow piles which we hollowed out into snow shelters, or "igloos" to sleep in. 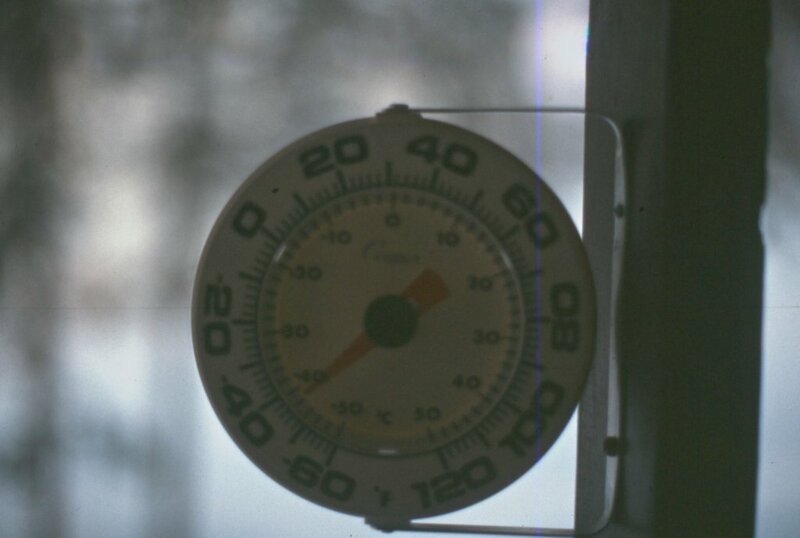 That winter night (-13 F.) I actually slept. 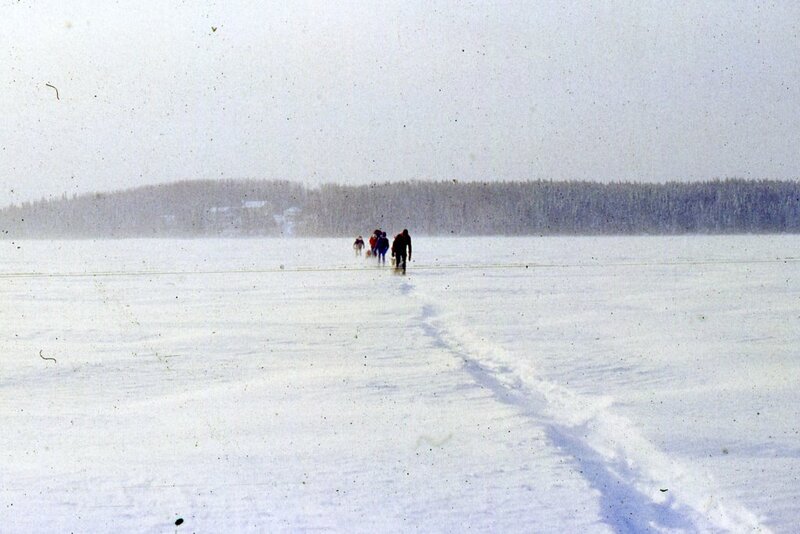 Here's a photo (from that camping trip in northwestern Ontario) of the snowshoe trail as we are heading out across the frozen, wind-swept lake. It's easy to see in this photo, that it was cold and the temperatures were well below zero. Here is a picture of our winter camp deep in the Canadian "bush". We are standing around the fire eating and at the same time preparing for the night by drying our mitts, scarves, and boot liners. That was a memorable and adventurous outing...although not exactly pleasant. 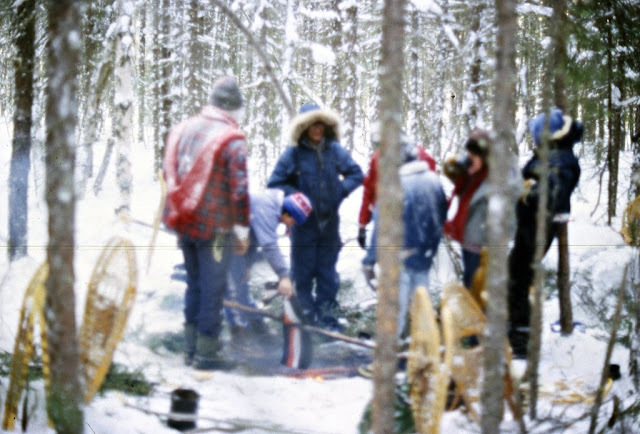 This is one of my favorite pictures of that winter camping trip in the Northwoods. Maybe because that's me on the left. 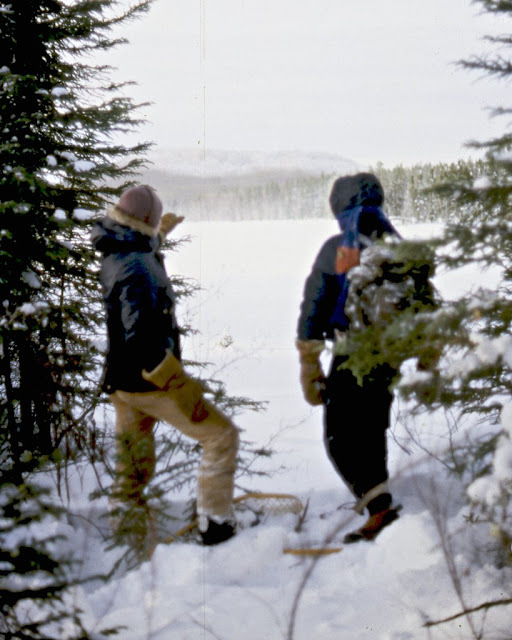 Maybe because of the sense of adventure brought to mind by those snowshoes, mittened hands, parkas, frozen lakes, and thick, snow covered bush country. I still have those snowshoes. I get to use them occasionally. Now I can sit by the campfire and say, "When I was young, the snow was deep..."
Yes, our evening winter picnic was tame, but it was very pleasant, and memorable, none-the-less. ha. Seasoned Reasoning. Love it. What lovely memories Dana. Both yours of your youth and the new ones made with the kids. At first I missed the minus sign before the 44. Holy cats, that's c-c-cold. Glad you knew what to do. I can see why you love the photo of you, looking out across the lake. It's wonderful. Just An Old Pitch Pine Stump?